Lietošana Vienmērīgi ieklāt tīros, ar dvieli nosusinātos matos. Ļaut iedarboties 2 minūtes. Izskalot. Preces apraksts angļu valodā: Kérastase Nutritive Lait Vital Nourishing Care Conditioner is a lightweight conditioner for normal to slightly dry hair. - Provides optimal nutrition for the hair fibre. - Restores moisture and shine. - Hair is steeped in softness. - Protects from the drying-out process. A daily conditioner that selectively treats and nurtures hair’s most sensitized areas without weighing it down. - Glucose: Provides an energetic boost for the nutrition of the hair fiber. - Proteins: Restore the nutrition deficiencies, leaving the hair nourished and steeped in softness. 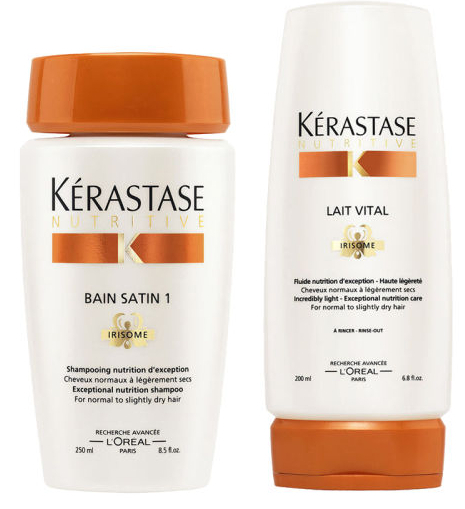 Directions: Apply a quarter-sized amount of Kérastase Nutritive Lait Vital Nourishing Care Conditioner to towel-dried hair and massage through the lengths and ends. Leave on for 2 to 3 minutes. Rinse thoroughly.